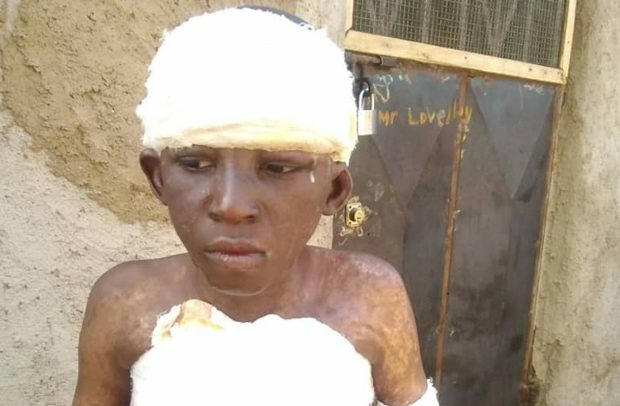 The accused person in the case of the 11-year-old-boy who was set ablaze for allegedly peeping a naked woman in a bathroom at Damweo in the Bolgatanga Municipality in the Upper East Region, John Nsobilla, made his first appearance in court on Friday, February 8, 2019. He has been charged for causing harm to 11-year-old Ayinbisa Maxwell, whose health condition is deteriorating due to poor management of his multiple deep wounds. Police Prosecutor, Chief Inspector Mohammed Andan, prayed the Bolgatanga District Court, presided over by His Lordship Osman Hakeem, to remand the accused person in police custody to enable the police to carry out more investigations. According to the police prosecutor, police has also gathered that the life of John Nsobilla could be in danger due to public rage against him after series of media reports on the health condition of the boy, for which reason he (the accused) should be kept in police custody for safety. The court, however, denied the police’s request and rather granted the accused person bail with four sureties, an amount of GH¢20,000 and two landed properties. John Nsobilla is to reappear in court on February 26, 2019. The police have renewed its commitment to prosecute the accused, after it had halted the case in 2017 due to the victim’s family decision to settle the case out of court. The accused was re-arrested on Tuesday, February 5, after media reports over the deteriorating health condition of victim came to the public. DAILY GUIDE has been reporting about the deteriorating health condition of Ayinbisa Maxwell, who is living with multiple deep wounds on his head, chest and both arms. The upper part of his body is wrinkling and producing foul-scented fluid. The accused was reported to have set the victim ablaze for allegedly peeping a naked woman in a bathroom in 2017, but he was not prosecuted then because the family of the victim had agreed to settle the case out of court, on the grounds that the accused person will pay the hospital bills of the victim.